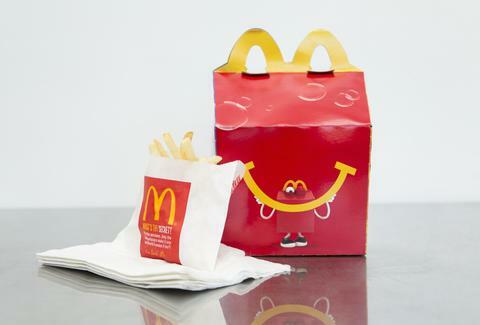 As they say in fast food and life, no good deed goes unpunished: Today, less than a week after announcing it would include fitness trackers with Happy Meals, McDonald's has discontinued them because they're apparently giving kids rashes. This is what happens when a burgers and fries place gets into the fitness game. Probably in an attempt to make you feel better about the food you've just watched your child consume, the world's largest hamburger chain released cheap kiddie fitness trackers along with their Happy Meals in the US and Canada locations. How thoughtful! Except they didn't last nearly as long as the meals' shelf lives; the Step-It! activity bands were causing skin irritation, which is kind of an "off of the flat griddle and into the deep fryer" situation. Now kids will never know how many steps they took during the hour or so of playing basketball it takes to burn off one 550-calorie cheeseburger Happy Meal. Who could've predicted that McDonald's cheap plastic step trackers wouldn't be of the highest quality? It's just as well, since diet plays a much bigger role in childhood obesity than lack of exercise, and if you're eating fast food all the time, you probably won't be able to outwalk it. But hey, no one can say they didn't try -- and, like most new fitness regimens, this one lasted about a week before they went back into a steady, familiar diet of burgers and fries. Christina Stiehl is a Health and Fitness Staff Writer for Thrillist who thinks McDonald's is gross... except for the occasional French fry binge. Follow her: @ChristinaStiehl.